FOURTH DEGREE HONOR GUARD AT THE MEMORIAL DAY MASS AT ASSUMPTION CEMETERY WINFILED IL MAY 30, 2016. 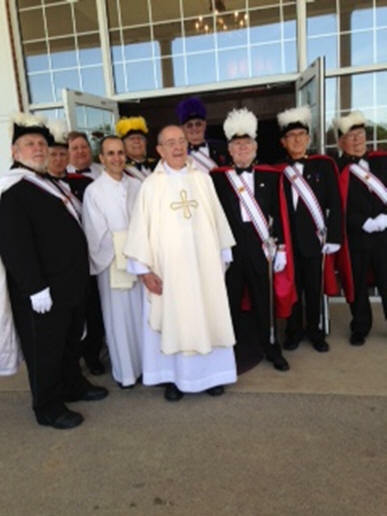 From the left Past Faithful Navigator Roger R. Dooley, Bob Nowakowski, Bob Cameron, Deacon John Spiezio, Former Master Phil Barrone, Fr. John Sullivan, Commander Wayne Decker PFN, Don Jeske, Bob Ratko, and Tom Janczy. Photo by Sandy Decker wife of Sir Knight Wayne Decker.